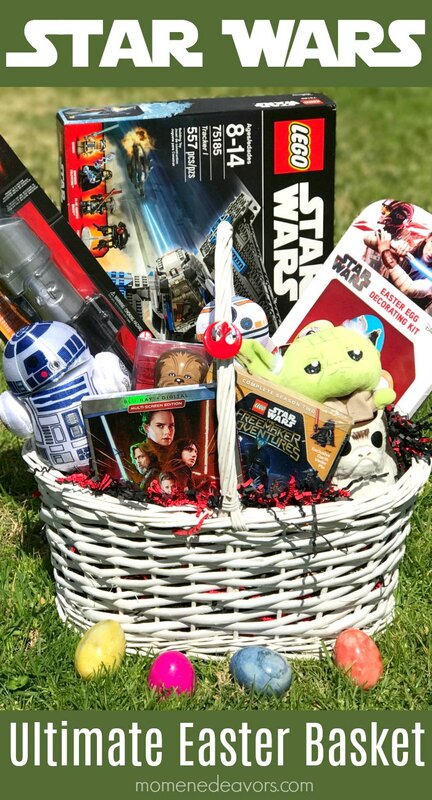 Do have you little padawans in your life that would love a Star Wars Easter basket?! Then this post is for you! 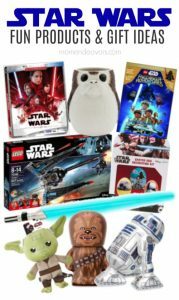 We’re sharing some fun Star Wars products, perfect for putting together the ULTIMATE Star Wars Easter Basket (plus an AWESOME giveaway)! Seriously, how fun is that Star Wars basket?! I LOVE it! We’ve made a Star Wars Easter Basket before, but it wasn’t quite as epic as this! You have a chance to WIN this one as we celebrate the DVD release of LEGO Star Wars: The Freemaker Adventures and Star Wars: The Last Jedi! I’m sure you’re already familiar with The Last Jedi (if not, be sure to read our Last Jedi review here), but you might not know about the Freemaker Adventures! You’ll find 12 action-packed episodes plus five bonus shorts on DVD – perfect for all kinds of out-of-this-galaxy fun! The DVD hit stores on March 13, 2018! So, you can pick up your copy today! In addition, Star Wars: The Last Jedi hits stores on March 27th! So, both could perfect additions to your Easter baskets this year! But before you buy it, you have a chance to win it!! So, who wants to win that awesome basket pictured above?! In addition to the DVDs, it’s full of some SUPER awesome Star Wars products. My boys would go CRAZY for that LEGO set! Crazy! SWEET! Doesn’t that look awesome? So, hurry and enter so you don’t miss out! Enter to win via the entry form below (Giveaway open to US Residents 18+, enter through 3/22)! The boys really want the Blue lightsaber. They would have a blast with that. So hard to choose, my girls would be excited about the movie and the light saber! Hands down the Last Jedi, but the LEGO set would be a big hit too! I think my son would love the blue light saber. I am excited about the Chewbacca 4” wind-up toy. Excited about the blue lightsaber. MOst excited about the movie Star Wars: The Last Jedi Blu-ray! My daughters are going to love and appreciate everything, so it’s hard to pick. However, they can never get enough Legos, so I will choose the Large LEGO set from LEGO Star Wars: The Freemaker. I’m most excited about the Chewbacca 4” wind-up toy! I’m most excited about the Lego set, my three boys would have a great time putting it together. My son would be excited about the LEGOs. I am most excited about The Last Jedi Blu-ray. Thanks for hosting the giveaway. I hope the Force is with me on this competition. Probably the Yoda plush pet toy. Yoda is my favorite character and my dogs and I love to wrestle over toys so they love new toys.